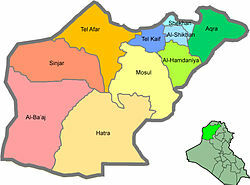 The Shekhan District is a district in the Nineveh governorate of Iraq with its capital at Ain Sifni. It is bordered by the Amadiya and Dahuk Districts of the Dahuk Governorate to the north, the Akre district to the east, Al-Hamdaniya District to the south, and the Tel Kaif District to the west. The Shekhan District was formed on December 16, 1924. After the 1935 Yazidi revolt, the district was place under military control. It is mainly populated by Assyrians and as one of two major population center of the Yazidis (some times catagorized as Kurdish). ↑ 1.0 1.1 1.2 "Basic information about Shekhan District" (PDF). Christian Aid Program in Iraq. Archived from the original (PDF) on April 25, 2012. Retrieved October 7, 2014. ↑ Fuccaro, Nelinda. Ethnicity, State Formation, and Conscription in Postcolonial Iraq: The Case of the Yazidi Kurds of Jabal Sinjar. International Journal of Middle East Studies Vol. 29, No. 4 (Nov., 1997), pp. 559-580. ↑ Shefler, Gil (August 7, 2014). "Islamic State accused of capturing Yazidi women and forcing them to convert, or else". Washington Post. Religion News Service. Retrieved October 7, 2014.